Make a donation. If your child has built up a balance in a charitable giving account, take a moment on Tuesday to talk about philanthropy and how those funds can make a difference. Then, help your child make a donation. Volunteer time. Teach your child that giving isn’t just about money. Plan a holiday volunteering stint together. Try a site like VolunteerMatch.org which has a way to narrow searches to opportunities suitable for kids and teens. Set a giving goal. Maybe your child just made a donation — like to the Red Cross for the Philippines disaster recovery effort. Outstanding! Use #GivingTuesday to sit down and set a new donation goal for the future. Savings goals don’t have to be just about purchases. Set aside a giving allocation. If you’re child isn’t setting aside a portion of each “paycheck” for charitable giving just yet, perhaps #GivingTuesday is a good day to have that conversation. Consider letting your child pick the percentage. The response just might surprise you. Get a giving card. Kids feel a tremendous sense of pride and ownership when they can make the donation themselves. But, in many cases, cash donations aren’t convenient or even possible. 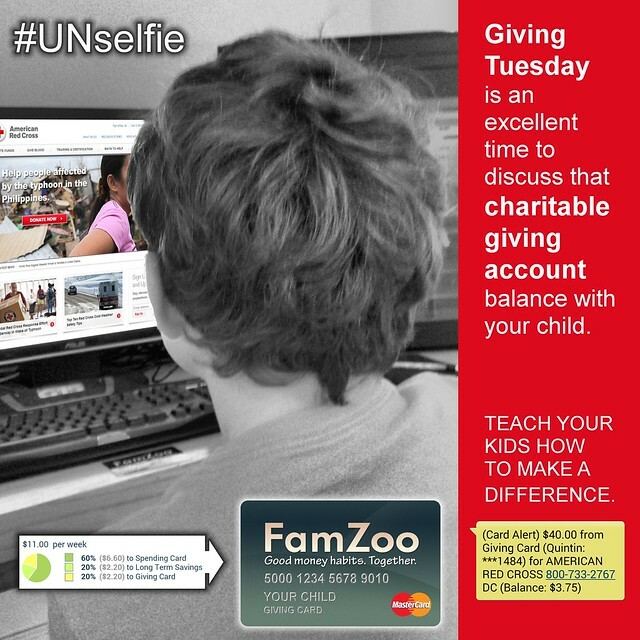 That’s when a FamZoo card for charitable giving comes in handy. Order one for your child.